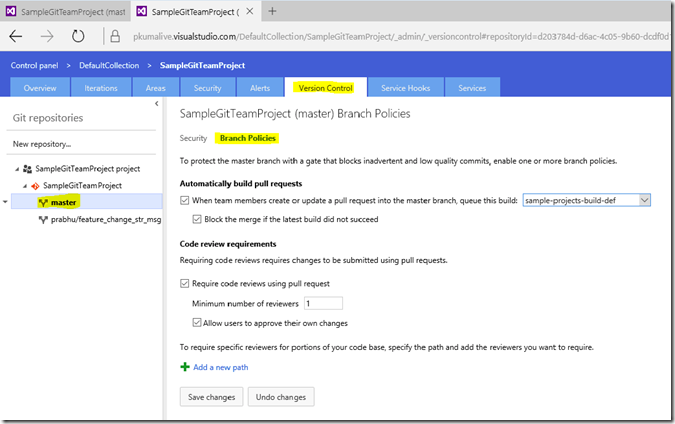 To setup branch policies login to your visual studio online account and navigate to the team project, which has the git repo you want to set the policy on. 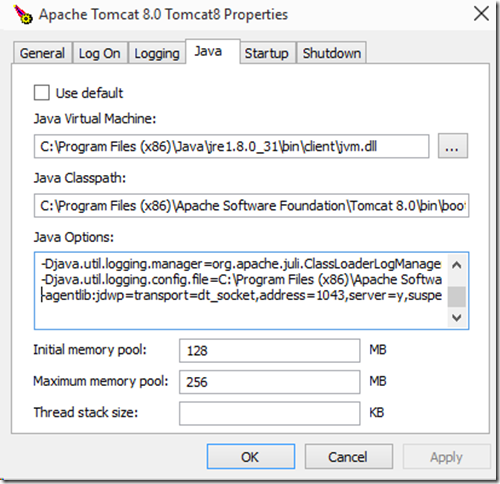 You will need to have administrator privileges on the team project to setup the policy. After you’ve navigated to your team project, click on the settings wheel icon on the top right corner, this will take you to the admin panel of your team project. 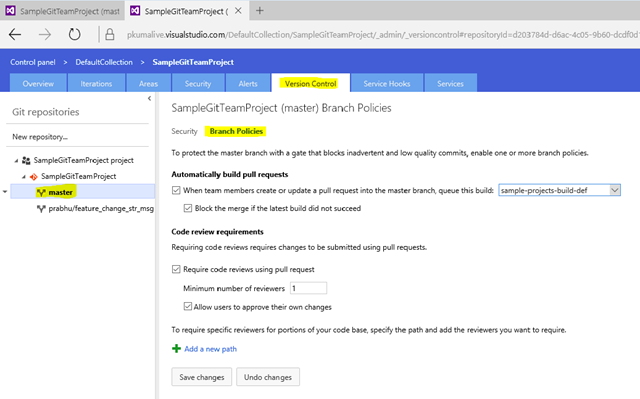 Select the ‘version control’ tab, and on the left rail select the branch you want to set the policy on (master branch in my case), and click on ‘branch policies’ tab. Refer the figure below, the click points are highlighted in yellow. 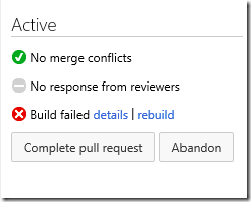 Under ‘Automatically build pull requests’, select both check boxes. 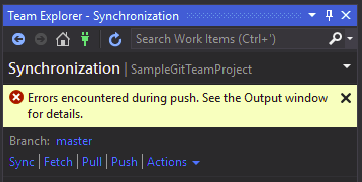 You will need to provide a build definition here which VSO will queue every time a pull request is submitted or updated with a new commit. The second check box, ‘Block the merge’, is actually optional, if you want to allow the merge even on build break, you can uncheck this. Though I’m not sure why you’d want to do that. 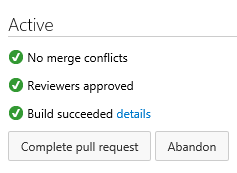 The last option, ‘Add a new path’, enables you to add reviewers optionally depending on the files involved in the commits. For scenarios where you really want Dave C to look at the changes if anyone modifies files under \kernel\base. It has support for wild chars as well. So what you need to do now, is move your changes to a feature branch, push that branch to server and create a pull request to merge the changes to master. 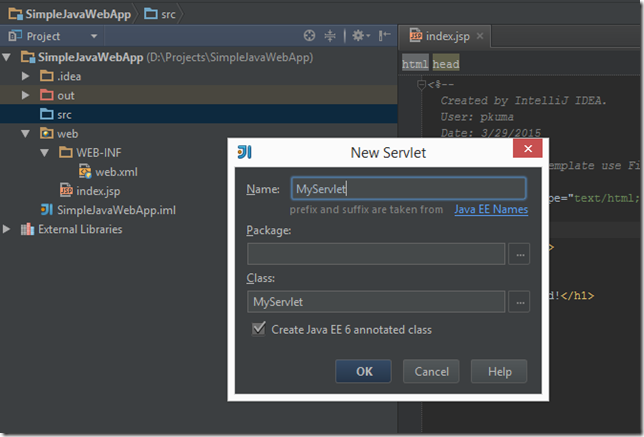 This workflow is explained in the link shared above. Now let’s say, the feature branch was pushed and a pull request was created, but the change list has a silly syntax error. You will see the branch policies show up in the right rail and a build will be queued for verification. 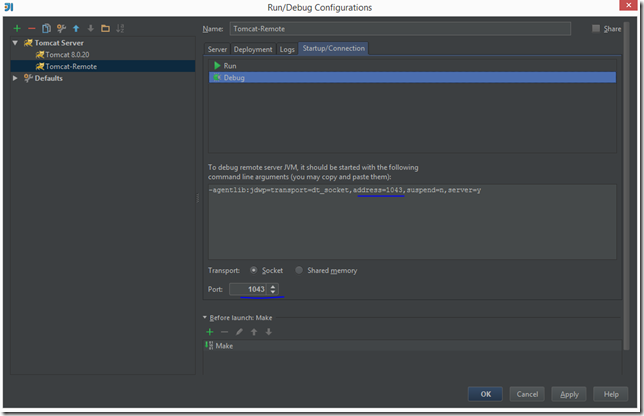 Since the pull request had a syntax error, the build will fail and attempting to merge the changes to master will be blocked. 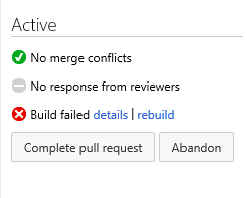 The next step is to fix the build failure, add a commit to the pull request and make sure you have at least one approval from reviewers. 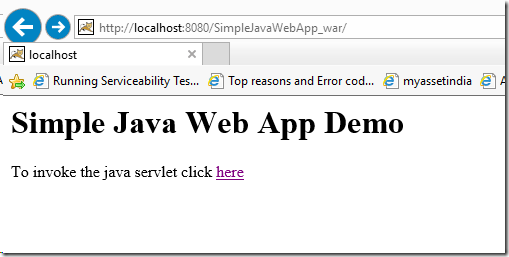 As soon as you push your local branch to server, a new build will be queued automatically and the status updated. 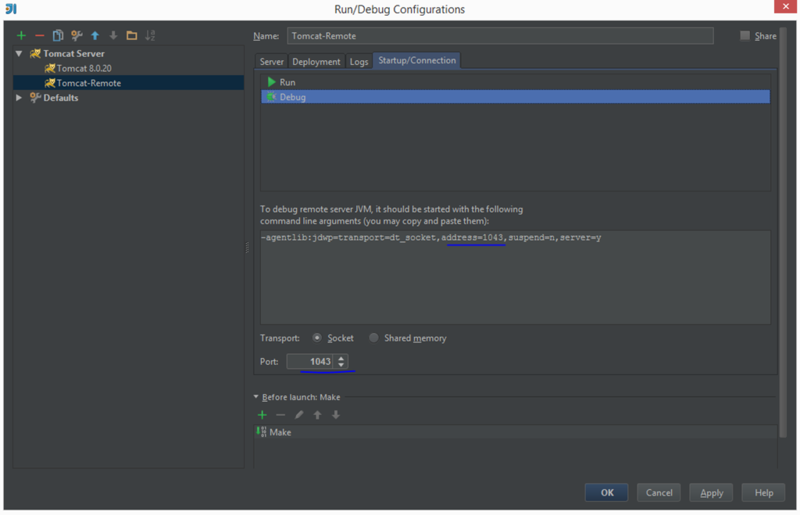 To enhance this even further, you can improve your build definition by, let’s say, adding a unit test build step and a code analysis build step, to ensure that all unit tests pass, before the pull request can be accepted and merged into master. In this post we’ll look at how to configure an on-premise build agent to work with your visual studio online account. If you haven’t given Visual Studio Online a try yet, I suggest you head over to https://www.visualstudio.com/, sign-in using your Microsoft account, create a free VSO account and take it for a spin! If you’re new to VSO, these channel9 videos should help get you up to speed. 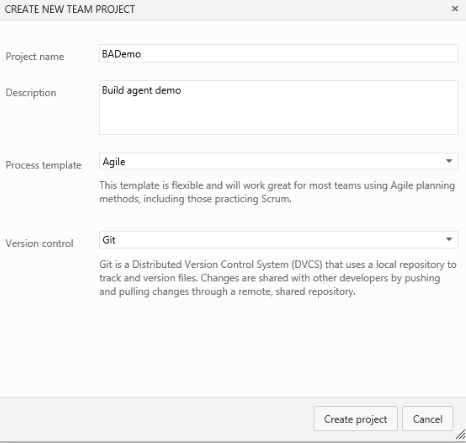 For our purposes here, we’ll create a new team project and add a simple Windows Forms application to it and set up the build agent to build this project. 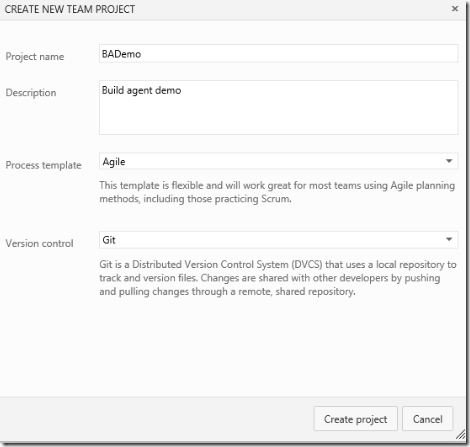 After you log into VSO, select the ‘new’ link from under ‘Recent projects and teams’ section to create a new team project. 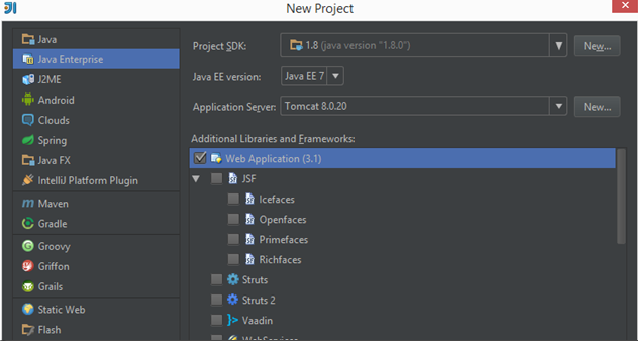 I selected Agile process template and git as the underlying version control, but these aren’t necessary for our discussion here, you can try out other combinations as well. 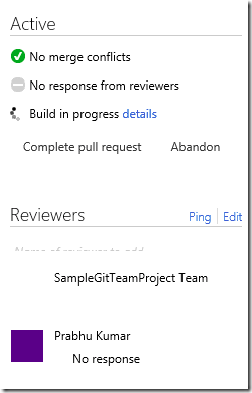 Navigate to the newly created team project and select ‘Open with Visual Studio’. This should launch Visual Studio and might ask you for credentials to connect to VSO. 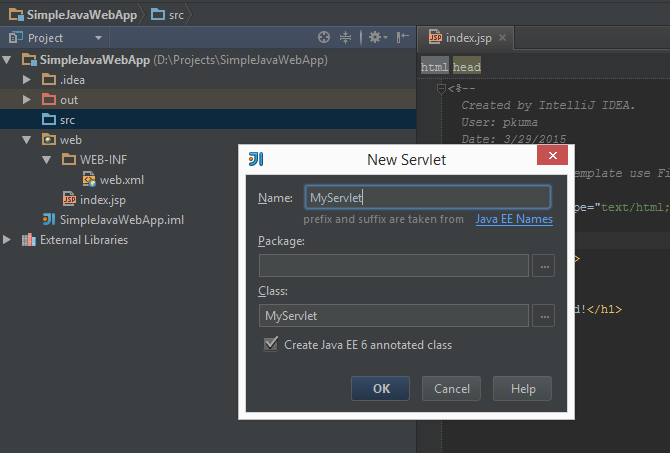 Clone the repository and add a new solution to the repo, commit the changes and push them to the server. 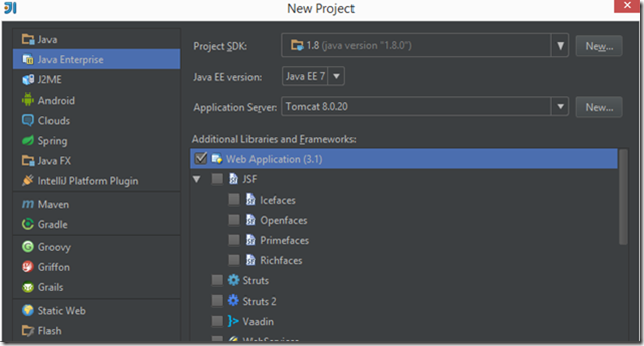 The project should now show up in the VSO portal. For the demo here, I’ll be using my trusty Lenovo ThinkPad as the build agent. Log into your VSO account and select the gear icon on top right of the screen to go into your account settings. 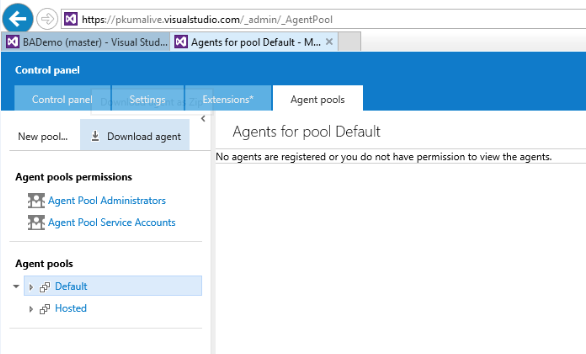 Click on ‘Control Panel’ and select ‘Agent Pools’. 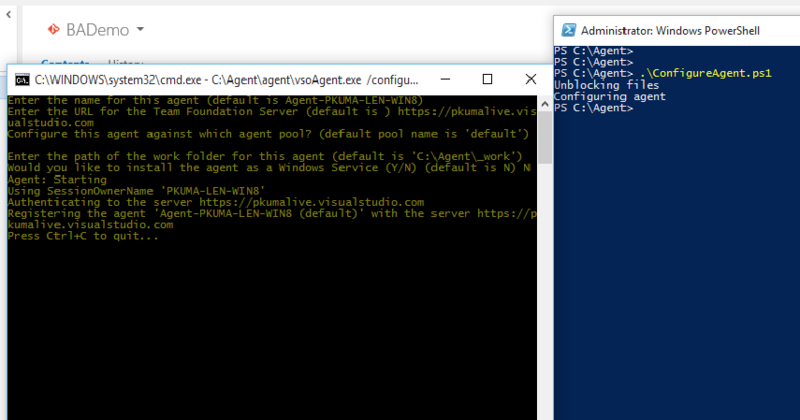 Click on ‘Download agent’ to download the VSO agent binaries and the scripts to configure the agent. 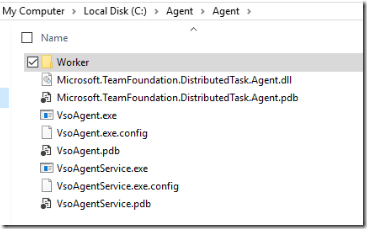 Save agent.zip to your favorite location on the disk and extract it (for e.g. to c:\agent). 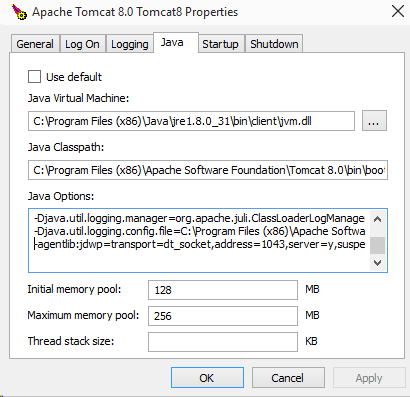 You might need to unblock the zip file before extracting it, just right click on the zip file, select properties and check the ‘unblock’ box. 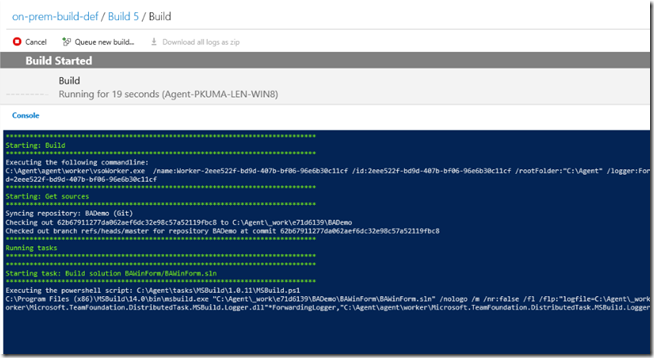 The zip file contains the binaries for the build agent and also a powershell script, ConfigureAgent.ps1, which will help you setup the machine as a build agent. 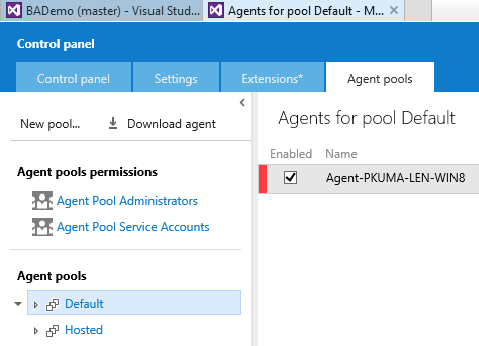 Your build agent is now setup and if you go to the account settings and refresh the agent pool, you should see the new agent listed under the default pool. And that’s it! 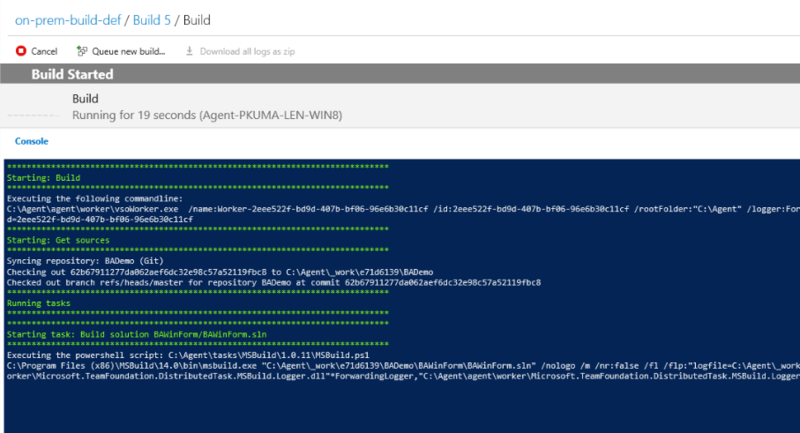 The build agent is now ready, we just need to create a build definition which will use this agent to build our project. 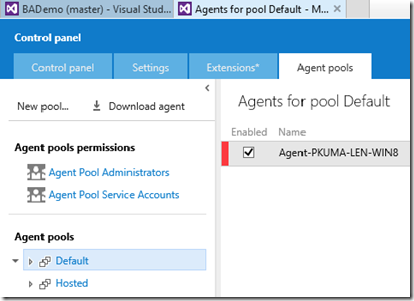 Note: The last step in the build agent setup, install as windows service, is optional. 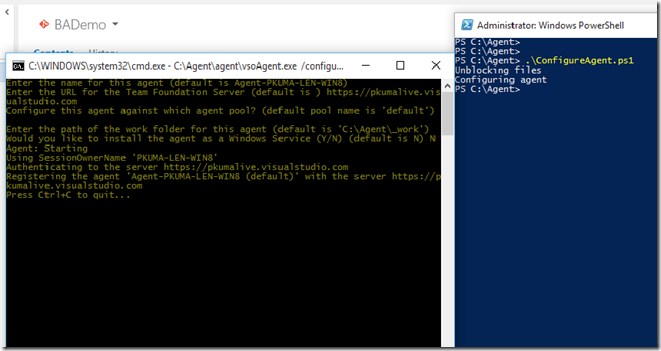 But I couldn’t get the project to build if the agent isn’t installed as a windows service. I will investigate this and update later. Go to the Build tab of your team project and click on + to create a new build definition. 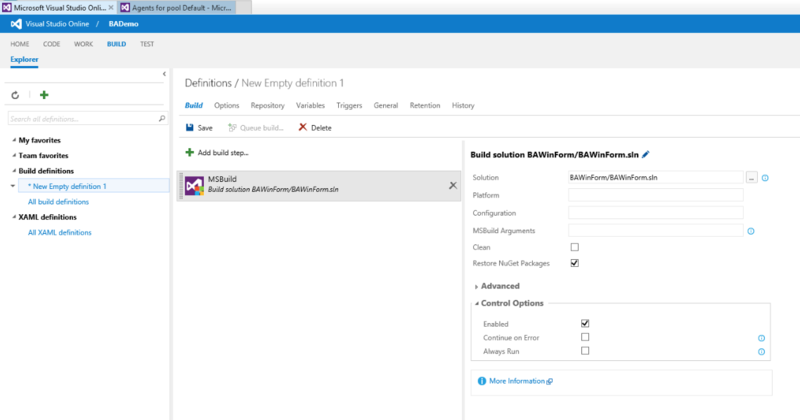 You can start from an empty build definition; add the ‘MSBuild’ task to the definition, browse and select the solution you want to build. 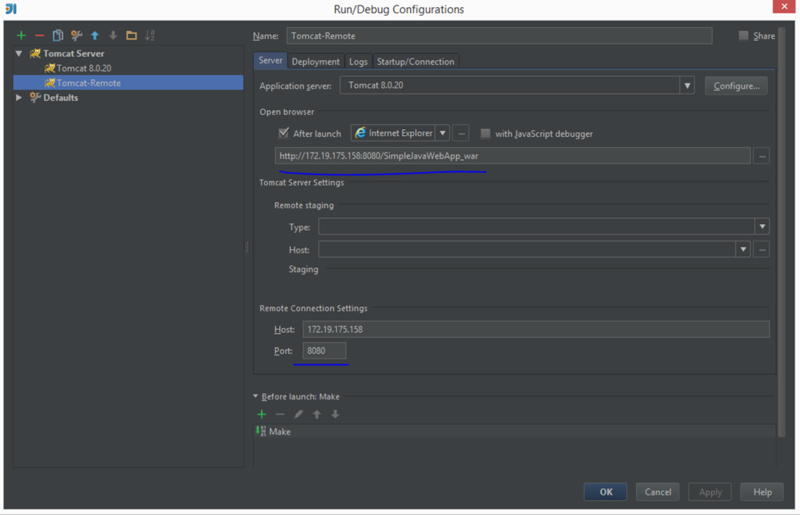 Under the ‘general’ tab, choose the default queue. 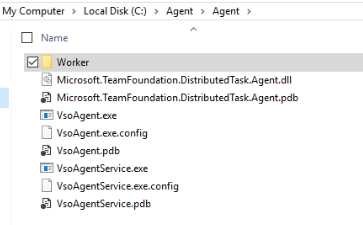 Remember this is what we used while creating the build agent. 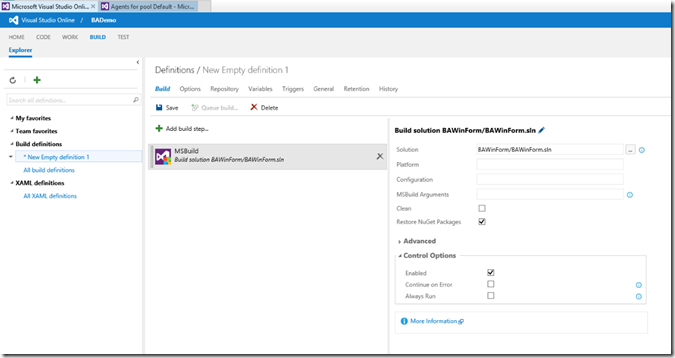 Give the build definition a name and save it. 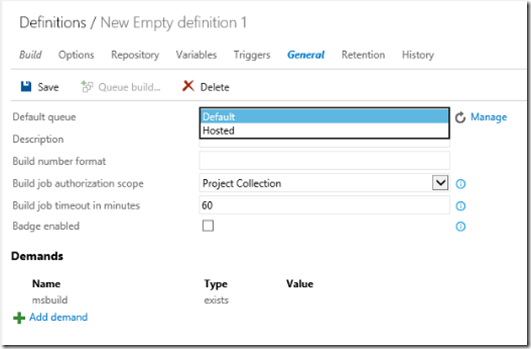 Select ‘Queue build…” after this to trigger a build. Within few seconds you should see the build being run. 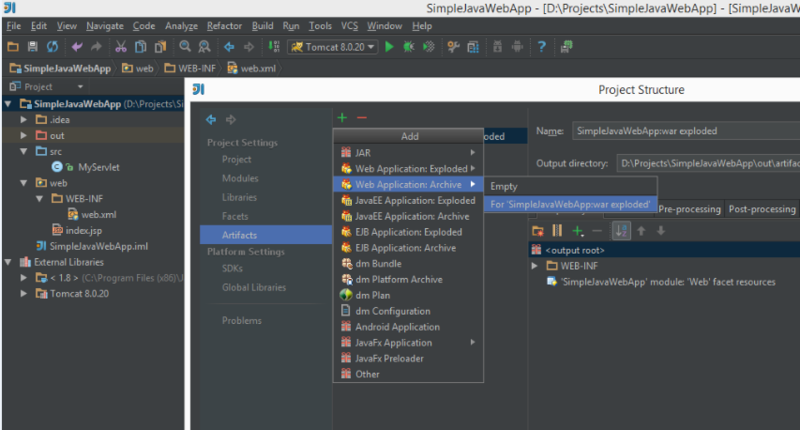 If you want to publish the build artifacts to a file share or any other location, you can add another task to the build definition ‘Publish build artifacts’, and set it up accordingly. Get ‘Programming Windows 6th Edition’ by Charles Petzold for $10! 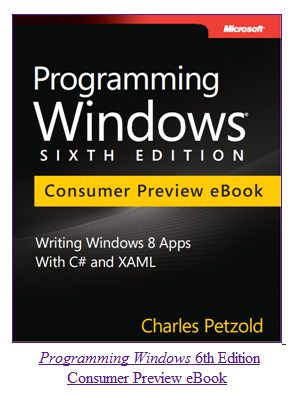 O’Reilly has a special offer on the new book that Charles Petzold is working on, Programming Windows 6th Edition. 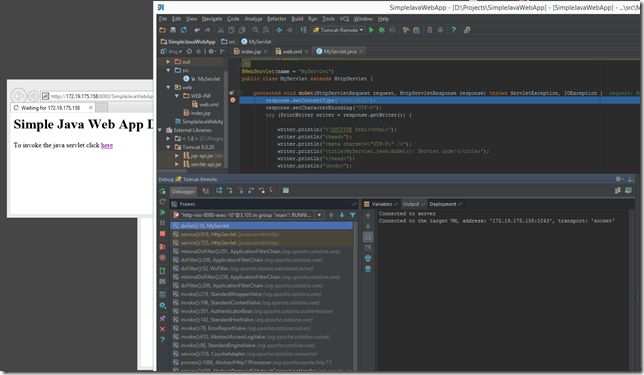 This should be a great book covering Windows 8 app development in C# and XAML. You can get this book for $10 now (offer lasts till 31st May), and future editions of this book, as and when new chapters are added, will be available to you for free. The book starts off with two best friends trying to communicate from across the street using only flashlights. This is how the idea of ‘code’ is introduced. It then takes you through a journey involving Morse Code, Braille and how telegraphs and relays were used to send codes over long distances. For me, the most interesting part is when he starts building logic gates from relays and switches. This lays a solid foundation for things to come. These logic gates are then used to build half-adders, full-adders (using two half-adders), oscillators, flip-flops and latches; finally getting assembled into a unit of Random Access Memory. Towards the end, a simple computer with processing, input and output systems is designed. The book might be a little old but still very relevant. The most amazing thing about this book? It teaches you concepts at such a fundamental level that your mind will be blown. And before you know it you will be building ripple counters from flip-flops! If you have anything to do with computers go read this book. You won’t be disappointed.